In my formative years, I spent countless hours in the backseat of my parents' car listening to them argue about whether or not they should pull over to ask for directions. I love my parents dearly, but I still can't comprehend how we wound up going north on I-95 driving from New York to Florida! 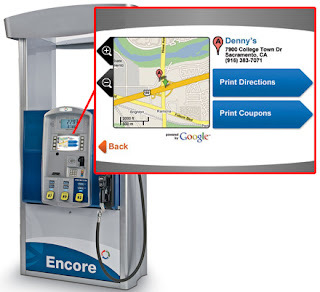 So I was especially excited to work with Gilbarco Veeder-Root to make driving directions and local business information available to people at the gas pump. Access to local information is so vital to our users, and it's especially relevant when they're not at home or at their desks. In the same way that we worked with Jet Blue and Virgin America to provide Google Maps on their flights, we want to make sure people can access the power of Google search whenever and wherever they need it. And if we can improve a family vacation or two along the way, so much the better! For more information, check out Gilbarco's press release.